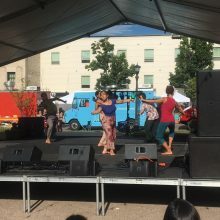 Ananya Dance Theatre performed at the 3d annual Little Mekong Night Market in St. Paul, July 24. 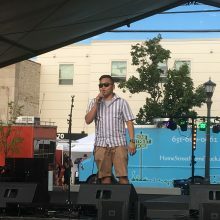 The performance was part of two days of events programmed on the Mystic Lake Casino Stage by the Center for Hmong Arts & Talent. Little Mekong Night Market is the Twin Cities’s Asian-inspired twilight street market, located in the heart of the Little Mekong District near the Western Avenue Green Line LRT Station. Little Mekong is the Asian business and cultural district in Saint Paul. Located between Mackubin and Galtier streets along University Avenue, the district boasts a diversity of cultures, top rated restaurants, and unique shopping experiences. The neighborhoods around Little Mekong include Frogtown and Summit-University.